At Tekko a few years back, I was browsing through the inventory of a CCG seller and stumbled upon the boxes of a card game called Weiss/Schwarz. I didn’t think anything of it until I saw the trial decks for Fate/Zero. I swear, the franchise is a weakness of mine, and without hesitation, I bought two copies of the same Trial Deck just to learn how to play. It wasn’t until this year that I finally got around to learning how to play this game correctly. Last year, I met a gentleman over our shared fandom because he was doing demos of the game, but due to my insane staffing responsibilities, I missed every chance to play, but picked up a few extra cards for my collection just to get things started. This year, I made time in my schedule to sit and learn how to play this game, and my friend spent a bit of time taking my small pile of cards (and some of his extras) to build a deck for me around my favorite character: Saber. The heavy hitter from the starter deck. I’m still on the prowl for a few more options to beef up my deck. So what does the game have to offer? I can assure you that it’s more than just Fate fanservice. Weiss/Schwarz is a collectible card game produced by BushiRoad. The majority of the themes are built around anime and Japanese pop-culture, including Hatsune Miku, Sword Art Online, Fairy Tail, Accel World, Persona 5, and many more. The major selling point is within the franchises, and legal decks can only use cards from the same franchise (so no, you cannot have Hatsune Miku working with Kirito). When I first tried to understand how the game played, it looked pretty complicated. You summon cards to the “Stage”, which consists of three Front and two Back positions. Front Stage characters can attack opponents on the opposite side (or, if there’s no opposition, deal extra damage to your opponent), while Back Stage characters are there for Support roles (often “Give character in front of you <Bonus>”). The cards you summon are limited based on your Level and what’s in your Clock or Level. 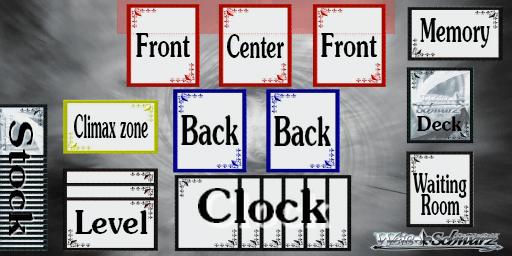 Like in games such as Magic, you have multiple colors with various themes, but in order to play a card of any color, you must have a matching color in your Clock or Level. 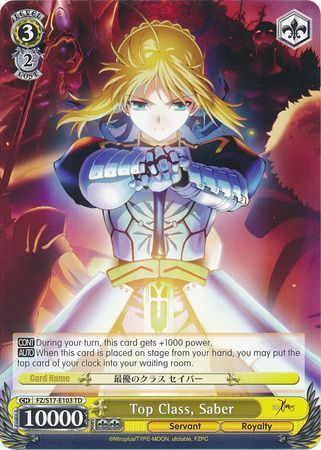 For example, this Saber card is yellow, so I must have a Yellow card in my Level or Clock areas. She is also Level 3, so I must be at Level 3 in order to summon her. The Clock and Level are actually linked together. Once you hit seven of more cards in your Clock, you put a card from that seven in your Level, the rest of those six go into your Waiting Room (Discard Pile), and anything over goes back into your Clock. Once you hit Level 3 and go over six cards in your Clock, you lose the game. Cards go into your Clock by taking damage or by putting a card into your Clock during the Clock Step. Cards also cost Stock, which is built up each time you attack or by special card effects. This part of the game really plays into tactics, as lower level cards often don’t cost Stock unless they have awesome effects, while the higher-level cards almost always have a cost associated with them. Climax cards are interesting, as you can only have eight of them in your deck, and they give an overall bonus to all of the characters on the field, such as increased power or damage. Then there’s cards that do more damage and give you more stock, like this version of Excalibur. When you attack your opponent, you have the option of a Head-On/Frontal attack (base damage to your opponent, but if your attack is lower, you can lose your card) or a Side attack (your base damage minus the opposing card’s level). Damage is determined by the card’s Soul, any bonuses from other card effects, and a “trigger” drawn from the top of your deck, with the results based on symbols in the corner of a card. Damage is pulled from the top of your deck and into your Clock, but if you draw a Climax card, the whole lot goes into your Waiting Room instead. After the attack is the Encore step, which is a time to revive fallen characters or using any special abilities that are designated during that step. Again, there are a LOT of moving parts, but after a few rounds, the game starts to make sense. As previously mentioned, the game revolves around fandoms, so you basically get a card game based on a fandom you love…if they have it. I’m a sucker for Fate/Stay Night and Fate/Zero, so I couldn’t pass up the opportunity. There’s also that nerdy “My fandom is better than yours” that crops up from time to time, and there are fans of one franchise that will want to prove that it’s superior to the others. This is always fun, even if it’s not a major selling point (mostly because it’s hilarious imagining Attack on Titan characters fighting Vocaloids). 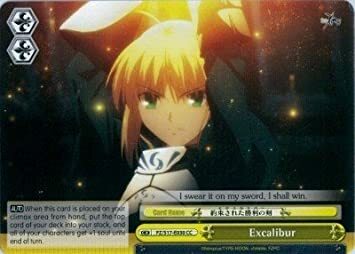 The artwork of the cards is pulled directly from the series in question, so all of the artwork from Fate is pulled from stills of the series. I do not think any card outside of promos uses original character artwork not seen in the series in question, which is always nice to see and makes for an easy transition. The game also has a nice element that I’m thoroughly happy with: the most expensive deck isn’t always the “best” deck. Yes, sometimes a ton of time and money into a deck will ensure victory, but I’ve seen a freshly opened starter deck beat relatively tuned decks between the luck of the draw and the game’s damage mechanics (i.e. you can always deal at least one damage per turn if you’re willing to risk a character, but a lucky Climax card ends all damage). In my case, I had an opponent outgunned as I had a whole table of Level 3 characters, but because of a cheap revive ability and the game’s damage mechanic, he was able to defeat me the turn after I hit Level 3. It was pretty interesting. I saw this same thing happen in a tournament. The most expensive deck at the event (partly because of autographed cards, partly because of sheer card cost) lost every match it entered in, and my only loss during the event was to a relatively low-cost deck that got really lucky. My own deck is lower-cost than most and got really lucky against some of my opponents, and I still left 3-1 there. As previously mentioned, there are a lot of moving parts to this game, so it is a bit daunting for beginners. I’m not a newbie to card games, but I struggled to learn it via just reading the rulebook, and needed to see it in action to understand it. My biggest gripe with the game is how hard it is to find and, in the same vein, the cost. In West Virginia, there are two stores listed on the BushiRoad website that carry the game. One of which has been closed for a few years (so I’m out of luck), while the other is about an hour away (not viable to drive out to on a regular basis). The closest “local” tournament I’ve been able to find, so far, was in Pittsburgh, a four hour drive away. Buying the cards otherwise is a challenge and rather pricey. Starter decks run about $20 and up, while booster packs run closer to $5; the protectors can run almost double what we see in other games, often due to the small supply (or being imports). When compared to other games like Magic: The Gathering, this is rather prohibitive. Because of this, it’s rather hard to get into. Few stores carry it, the fanbase revolves around set fandoms making trading difficult unless you find people that part of that same fandom, and the after market markup is insane. I don’t even mean on single cards (which can get pretty bad), but I’m referring to people selling booster packs. You also won’t find as many card lots up for sale, so again, getting in is rather tough. Overall, I’m giving Weiss/Schwarz 3.5 buns (the half bun is generosity for involving my fandom). While it is clear it is cashing in on fandoms, the game is not horribly welcoming to newbies, and seems to promote a type of elitism that we see in old guard Magic: The Gathering players. Between this and the high cost, it’s hard to give the game a better rating. Weiss/Schwarz is available to purchase online or at a store near you. If you enjoy card games and you find your fandom here, it’s worth looking into. Otherwise, give it a pass and stick with what you love.